Mobile phone companies have until Tuesday to cut by up to 70% the amount they charge customers for making and receiving calls between EU countries. Under the new EU rules, the companies have a deadline of the end of July to offer customers a new pricing structure, with cheaper "roaming" fees. Users have two months to say whether they want to move to the new plans or stick with their existing contracts. If they do not opt out they will be put on the new contract automatically. Capped roaming charges will apply to all telecoms firms in the 27-member EU. They follow a lengthy investigation into the market by the European Commission. 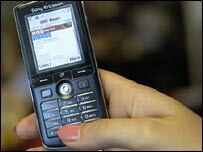 The Commission calculated mobile phone firms made about 8.5bn euros ($11bn; £5.7bn) profit a year from roaming fees.